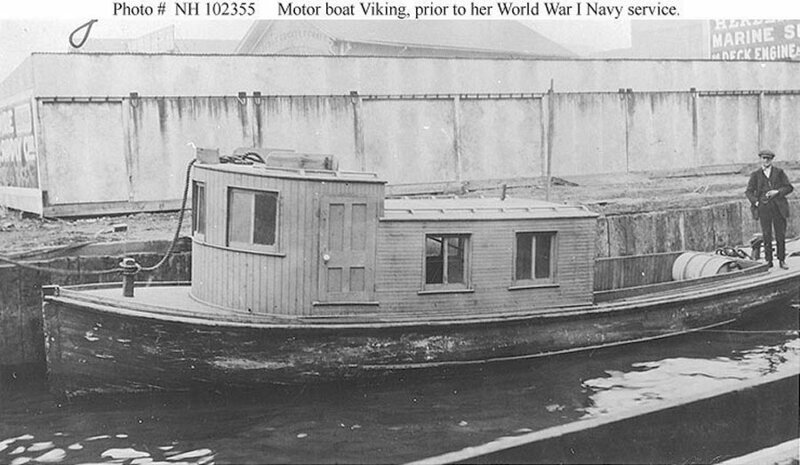 Motorboat: Built in 1915 as Ceasar by the U.S. Navy and then apparently sold into civilian ownership soon thereafter—was inspected by the Navy on 5 September 1918, assigned the classification SP-3314, and acquired from a Mrs. E. S. Wood on 24 September for use as a section patrol boat and placed in service as Viking. While no deck logs for this vessel have been found, available records indicate that she operated in the 5th Naval District, probably in noncommissioned status. On 2 February 1919, the Secretary of the Navy authorized the Commandant of the 5th Naval District to dispose of the boat as "junk." She was struck from the Navy list on 19 February 1919 and sold the following day. Fate unknown. Specifications: Displacement 10 t.; Length 42'; Beam 10'; Draft 6'; Speed 5.1 kts. ; Complement unknown; Armament none. 107k In port, probably at Norfolk, Virginia, prior to her World War I Naval service.